You’ve NEVER heard the C Major scale played like this before – EVER. If you or your piano students think scales are boring, after playing this, the C Major scale will seem pretty cool. I want everyone to download this “Cool Song” for FREE and share it with your friends and family. If you are a piano teacher, your piano students will love playing the C Major scale like they never have before. They will know, as we do, that scales are cool. If you are a piano student, you will have a whole new appreciation for scales. Have fun with this. Share this post with your family and friends (anyone who thinks scales are boring and needs to have fun playing the piano). This can be shared clicking on any of the share buttons below the post (e.g. to Facebook, Twitter, LinkedIn, Pinterest, and many more social sites). 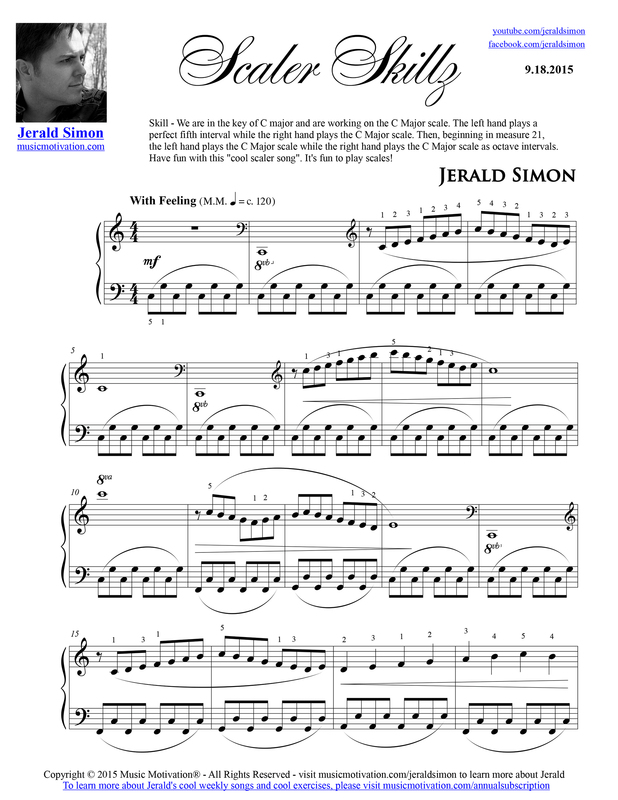 Subscribe to my YouTube page (youtube.com/jeraldsimon) so you can watch new monthly “Cool Songs” and “Theory Tip Tuesday” videos I post as resources for piano teachers, piano students, and parents of piano students, and then share this video (here is the link you can share: https://www.youtube.com/watch?v=KHdQJnpu7bw&list=PL9eocDI3QWNhiErbkK29DtnFZ24vvR8yx&index=1) on any of your social sites so your friends and family members can see how much fun scales can be. That’s it! I hope you enjoy this “Cool Song” from my “Cool Songs Annual Subscription” where I compose and come out with a new “Cool Song” every month to help teach the FUNdamentals of music theory. I hope students learn the practical application of music theory the fun way – with “Cool Songs” that have minus tracks they can play along with and watch informative and educational piano video tutorials. Thanks for watching and downloading this free “Cool Song” and for sharing this with friends and family members who need a little Music Motivation® in their life! To download the MP3 music of the “Cool Song”, simply click on the images below. You will be taken to a url website link. A rectangular box will be in the center of the page. Hover your mouse over the box and right click. A box will then list options. Click on “Download Video” and you will download the MP3 to your computer. It is the same with all of the MP3s listed below.